Today Virgin Galactic and Scaled Composites will roll out SpaceShipTwo (SS2) a commercial passenger carrying spaceship derived from the winning ship which captured the $10M Ansari X PRIZE for spaceflight in 2004. While SpaceShipOne (SS1) carried only one pilot and two passengers, the much larger SS2 will be flown by two pilots with seats for six paying passengers. Five years ago, 20,000 people gathered at the Mojave Air & Space Port to watch as Burt Rutan and his team at Scaled Composites, backed by Paul Allen, accomplished what many considered impossible – building and flying a privately funded, privately piloted spaceship, twice, to altitudes above 100 kilometers. On that fateful day, October 4th, when the ship successfully flew its second flight into space, it carried on it the Virgin Logo and a pledge from Richard Branson to fund a commercial version to carry the paying public into space. Well, here we are. The commercial version is now built and will soon start test flights. While the project is a few years behind schedule, it has made incredible strides. Branson and Will Whitehorn (the CEO of Virgin Galactic) have committed hundreds of millions of dollars to get it to this point and everyone is the space community is very thankful. Equally of note to the hardware rollout, is the confirmation of the marketplace. Tens of thousands of people have gone online to register for a future seat, and some 250 of them have put down the full $200,000 deposit to be amongst the first to fly. A new era of private spaceflight is unfolding in a very similar fashion to the early days of aviation. In the decades following the Wright Brothers, “tourism flights” were the primary mechanism by which those early aeronauts earned their living. Barn-storming, as it was called, offered an individual the opportunity to pay a handsome sum (typically a month’s wages) to fly to the death-defying altitude of 5,000 feet from which he/she could view their town from the air. Soon, barnstorming gave way to real aviation businesses such as airmail and passenger point-to-point carriage. In the same fashion, a number of commercial providers, in addition to Virgin Galactic, will offer space tourism flights in the years ahead. These flights will then be followed by flights carrying scientific experiments and flights conducting astronaut training. So who else is building vehicles and selling seats? First it should be noted that Space Adventures has been carrying privately paying passengers to orbit, to the International Space Station, for the past 9 years using the Russian Soyuz (Disclosure: I am a co-Founder and Managing Director of Space Adventures). Space Adventures has also sold over 100 seats for future suborbital flights at a ticket price of $98,000. In addition to Virgin Galactic and Space Adventures, three other companies fit prominently in this era of private spaceflight. John Carmack, CEO of Armadillo Aerospace and creator of the video games ‘Quake’ & ‘Doom’ is developing a passenger carrying suborbital vertical take-off/landing ship. His vehicle is a derivative of the ship which was one of the two winners in the Northrop Grumman Lunar Lander X PRIZE Challenge (Masten Space Systems was the other winner). In addition, Jeff Bezos, founder of Amazon.com has started a space exploration company called Blue Origin which has been cloaked in secrecy for the past 5 years. “Blue” as it’s called, is focusing on a variety of human carrying designs, the first of which is a vertical take-off, vertical landing sub-orbital ship. Blue is also rumored to be working on orbital flight as well. The third prominent player is SpaceX, founded by PayPal Founder, Elon Musk. SpaceX is developing orbital passenger carrying capability using the Dragon Capsule, which will fly about the Falcon-9 booster to orbit carrying future Astronauts to the International Space Station for NASA. The first test flight of Dragon/Falcon-9 is scheduled for February 2010. How cheap could a seat get? First we need to distinguish between sub-orbital and orbital flights. Getting to orbit (i.e. going completely around planet Earth in a 90-minute orbit) is approximately 50-times harder than just going up into space and back down to the Earth on a suborbital flight. Today, Virgin Galactic (a suborbital provider) is selling seats at $200,000. Neither Armadillo or Blue Origin have announced seat prices. But theoretically, in my opinion, we could likely see the price per seat for sub-orbital flights drop rapidly over the next decade to under $50,000 per person. In the orbital world, today, Space Adventures offers a seat to orbit aboard the Russian Soyuz for about $45M+. The first orbital passenger, Dennis Tito, spent $20M and the latest Space Adventures customer, Guy Laliberte, paid in excess of $40M. If all goes well, in the decades ahead, I hope we’ll see the price return to $20M and eventually to a price under $5M per person. I’d like to also point out how magical it is that SS1 and SS2 are being designed and built by a small group of designers enabled by incredible technology. While it once took the wealth and resources of a nation to fly into space, it is now possible for a smart and dedicated team to build such technology. In the case of SpaceShipTwo, special recognition to Burt Rutan, Scaled CEO, Doug Shane, Scaled designers, Jim Tighe, Bob Morgan, Matt Stinemetze, and Marc Zeitlin and Scaled Flight Test Operations Chief, Pete Siebold. Ultimately, it’s easy to dream and talk about spaceflight, but it comes down to those who put up their wealth, reputations and time. 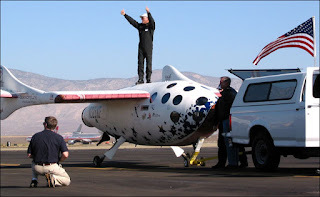 It is for this reason that today I praise Richard Branson, Will Whitehorn, Burt Rutan, Paul Allen and the Ansari Family for their role in SpaceShipOne and SpaceShipTwo. We all share a mutual desire and vision to enable the day when tens of thousands of people will be traveling beyond the Earth on a regular basis. So, congratulations to the Virgin and Scaled teams for today’s success. I wish you the best of luck in the months ahead as SpaceShipTwo enters into its test flight, and look forward to its first commercial flight in the near future.